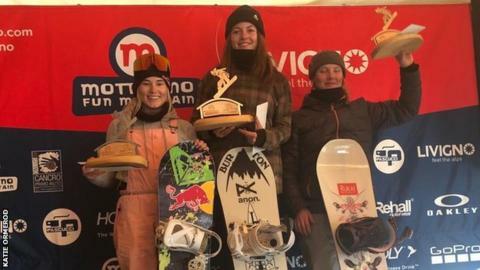 British snowboarder Katie Ormerod won a silver medal on her return to competition after breaking her heel on the eve of the 2018 Winter Olympics. Ormerod, 21, finished second at the slopestyle Europa Cup in Livigno, Italy, with team-mate Matt McCormick winning bronze in the men's event. She returned to the slopes in February, 12 months after suffering the injury in Pyeongchang, South Korea. Ormerod said on Instagram she was "so excited" to be back on the podium. "Couldn't be happier to be back on the podium after such an intense injury and rehab!" she added. "My 'return to snow' is going great!" Ormerod scored 74.33 points to finish behind Belgium's Loranne Smans, with Finland's Carola Niemelae taking bronze. In the men's event, McCormick finished third behind Swiss duo Jonas Boesiger and Jonas Junker.